Baby Cole enjoys helping me pack Miss Emma’s healthy lunches for the baby sitter’s house. 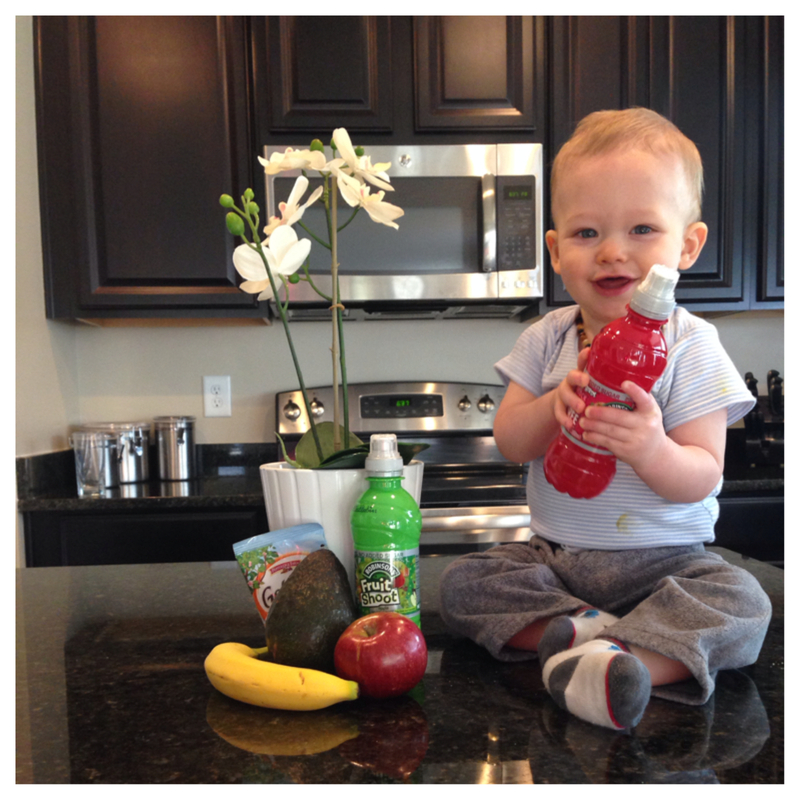 Emma and I are thrilled to review Fruit Shoot — a healthy, and kid-friendly drink perfect for any lunch box. This post is generously sponsored by Robinson’s Fruit Shoot, and I am very excited to tell you all about the product. Start packing healthy items from the get-go. I’ve been packing veggies, raisins, avocados, bananas, and other healthy items for Emma since she was able to eat solids. 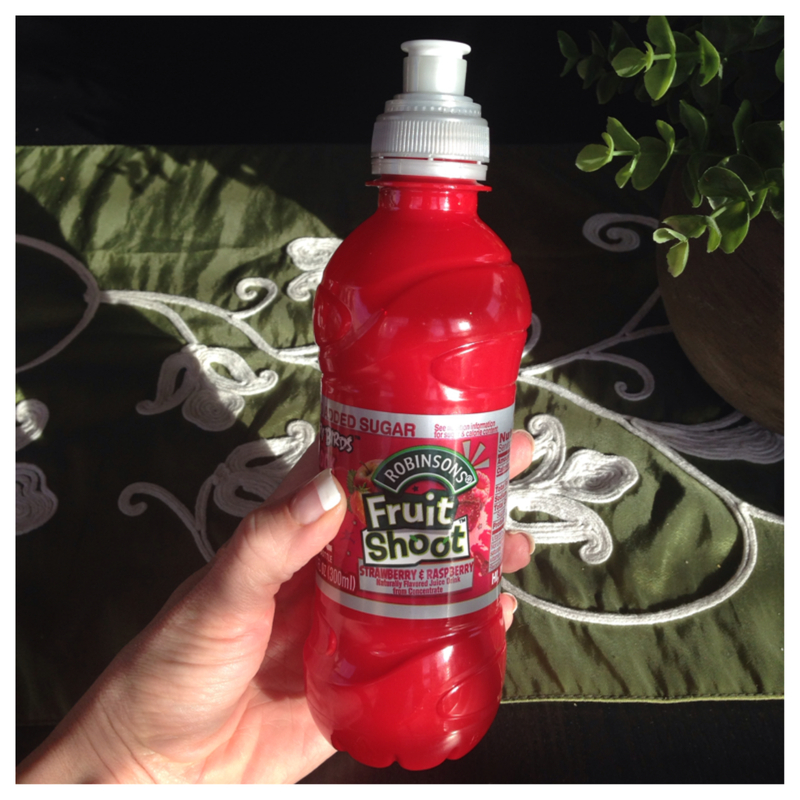 I’m so excited to have Fruit Shoot — a no-mess healthy drink alternative now too! Prepare the night before. I don’t like feeling rushed in the morning. I typically wake up before the kiddos, get showered and ready, wake Cole up to nurse him, and then get Emma ready to run out the door. It’s so great if I already have a diaper bag and lunch box packed to grab and go. Pack healthy no-spill items. In the past, I’ve packed applesauce, yogurt containers, crumbly crackers, and other messy items that the babysitter chooses not to take out of the lunch box and serve to my energetic 2-year-old. Fruit Shoot is the perfect solution! With it’s no-spill cap, it’s perfect for Miss Emma. Fruit Shoot contains no fructose corn syrup, added sugars, or natural flavors, and it’s only 15 calories total – making it a much healthier option than other flavored drinks. Add variety to your toddler’s lunch boxes. I try not to pack the same items every day. I want Emma to try a variety of foods and drinks. She’s not a picky eater at all, and I think part of her willingness to try food items is because we’ve always presented her with a variety of healthy items in her lunches. Keep your kiddos hydrated by providing fun, healthy drinks. With the amount of running and playing Emma does at the baby sitter’s house while I’m working at the gym with clients, she needs a lot of hydration! It’s sometimes hard to get her to drink water, but Fruit Shoot is tasty and fun to drink! See what Emma thinks in the video below. I am so glad Emma and I were introduced to Fruit Shoot. Fruit Shoot is available at a lot of retailers in Dayton including: Walmart, KMart, Kroger, and Dollar General. The vibrant fun colored Fruit Shoot bottles come in tasty flavors of Orange, Apple, Berry Burst, and Strawberry/Raspberry. Watch Emma’s Fruit Shoot review. For more information about Fruit Shoot, visit their Facebook Page. Not only is Fruit Shoot a great alternative to other sugary fruit drinks, but with a purchase of Fruit Shoot, there is the option for a free download of an Angry Birds game — perfect for parents to play with their kids. Download the Angry Birds game and enter the code on the back of your Fruit Shoot bottle to play! Fruit Shoot has a no-spill cap that makes the drink perfect for Emma’s lunches. What healthy items do you pack in your kiddo’s lunch boxes? I would love to hear your ideas. Also, be sure to let me know if you try Fruit Shoot too! Heya i’m for the primary time here. I came across this board and I in fijnding It reallky helpful & it helped me out a lot. I’m hoping to offer one thing back and aid othes such as yyou helped me. Do you ever run into any browser commpatibility problems? A handful of my blog audience have complained about my website not operating corrsctly in Explorer but looks great in Opera. Do you have any tips to helpp fix thos issue? a large amount of work? I’m completely new to operating a blog but I do write in my journal everyday. I enjoy what you ghys are up too. This kind off cpever work aand reporting!